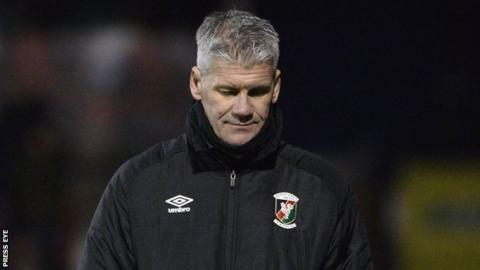 Glentoran say they are "reviewing all options" as they consider manager Gary Smyth's position at the club. Smyth has been told that he cannot remain in the role after this week according to the Belfast Telegraph. The 49-year-old is working towards his A licence but is still short of the coaching badges required to take charge of the club in European competitions. Glentoran, currently seventh in the table, have until Sunday to apply for a licence to play in Europe next season. "The club is reviewing all of options that we have for the European licence ahead of the deadline on Sunday," a Glentoran spokesperson told BBC Sport NI. "No decision has been made as yet and Gary is still very much part of the future here." Former Glens defender Smyth was promoted to manager following Ronnie McFall's resignation in January and has helped the club to move away from the threat of relegation since he was appointed. Smyth stepped down as manager of Championship side H&W Welders to join the Glentoran coaching team last summer when he was given a three-year contract along with assistant manager Paul Leeman with the expectation that they would eventually succeed McFall at the Oval. The Glentoran spokesperson added: "Gary and Paul do not have the necessary coaching badges, the club knew that when they were appointed and they were enrolled on coaching courses, which is why they were appointed to work under Ronnie McFall in the medium term. "But Gary and Paul are still under contract with the club and they're still very much part of the plans for the club." In his 11-game spell as manager, Smyth has led the Glens to five wins, four losses and two draws, helping the east Belfast side to challenge for the European play-offs.